The design reflects Mr. Millin’s long-time work as a writer and editor as well as Secretary of the Science Council of Canada, the feather pattern referring to quills, a writing instrument. The open book refers not just to Mr. Millin’s interest in writing and teaching, but also to his degree from Oxford University, which includes such a book in its arms. The bald eagle is a majestic bird found in British Columbia, and it has special meaning for Mr. Millin and his wife. The wildcat is taken from the badge of the Clan Chattan, and here it pays tribute to Mr. Millin’s mother’s ancestry. 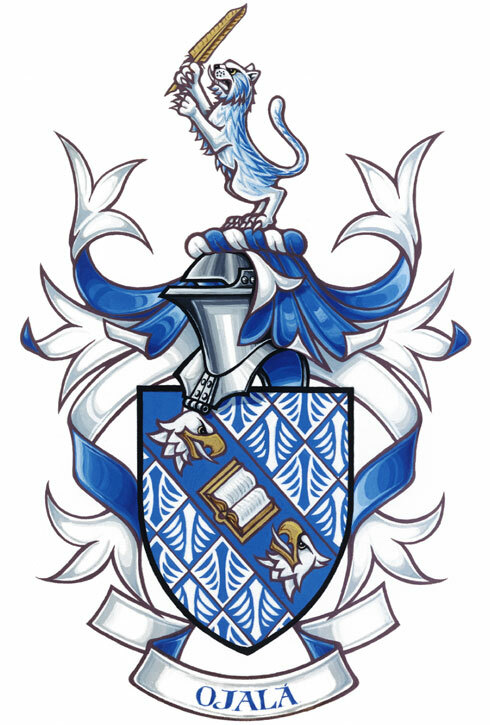 It is shown in the colours of the arms and it holds a quill in order to make a clear connection with the design on the shield. The Motto, a Spanish interjection meaning “I hope so,” is implied statement of submission to the will of God. This Spanish motto is an appropriate reference to Mr. Millin’s special affinity with Mexico.